At Set Your Stage in Calgary, Earth Day isn’t just about one day of the year. 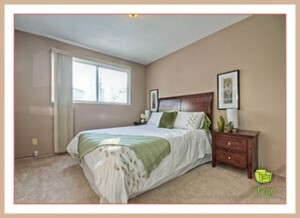 We make eco friendly staging choices on a regular basis. If you also value making green choices, it’s one more reason to consider this a factor in your decision making when you hire your next professional home stager. It’s time to sell your home or condo. You want to stage it to sell. 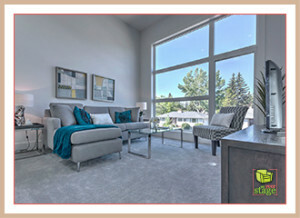 But which one of the multiple Calgary home staging companies should you choose? If eco friendly staging matters to you, take a look at Set Your Stage. After: We used cool greys and blues to complement the colours in this living space. The sofa was eco-consciously purchased at a consignment store. Still in great shape and very stylish! Cleaning supplies are natural, not synthetics. After: These nightstands got damaged in a move. Instead of tossing them in the trash, Jen sanded, repaired and refinished them. Now this bedroom is the perfect retreat for any homeowner! As a Calgary home staging professional, my job is to help you get your property sold quickly and for top dollar. 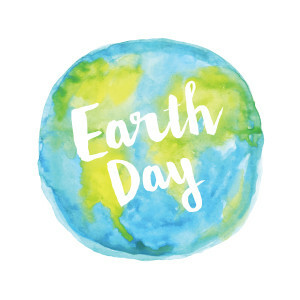 I’m proud to offer an eco friendly staging option – on Earth Day and every day – and will continue to deepen this commitment. We can all make a difference. It’s a matter of making more conscious choices. If you are planning to sell your Calgary home or condo and value eco friendly choices, I invite you to find out more and contact me, Jen Campbell at Set Your Stage, where we get proven results for our clients. This entry was posted on Friday, April 22nd, 2016 at 3:11 PM	and is filed under About Jennifer Campbell. You can follow any responses to this entry through the RSS 2.0 feed. You can skip to the end and leave a response. Pinging is currently not allowed.